Vermont is known as the “land of milk and honey” and the honey that Champlain Valley Apiaries produces is the highest quality blend of Vermont and Canadian honey from clover and alfalfa blossoms since 1931. It is light in color with a delicious, delicate flavor. They offer both crystallized (or raw honey) and liquid honey for the convenience of their customers. Extracted and packed in its natural state, crystallized honey is neither heated nor filtered, thus retaining its original flavor, vitamins and other nutrients. Their liquid honey is heated which delays the crystallization process but preserves as much of the flavor and original properties as possible. 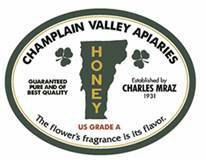 Established by Charles Mraz (1905-1999), Champlain Valley Apiaries is entering its third generation of proprietorship. Champlain Valley Apiaries works with approximately 1200 hives that the firm has located throughout the Champlain Valley, from Orwell, VT to the Canadian border. Charles’ grandson Charles E. “Chaz” Mraz has moved back to Middlebury from New York City where he was a senior project supervisor with Sciame Construction Co. Inc. to continue the family tradition.